Look at all of those happy vegetables. They seem delighted to be pureed, processed, and turned into waffled snack foods. How can one disappoint them and not give them a try, particularly when the implication that this is like eating healthy, healthy vegetables is in the product name. 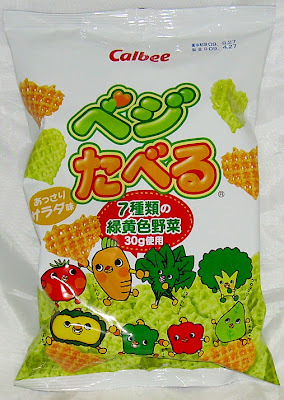 The front of the bag says that there are 7 kinds of vegetables, though not all of the vegetables are used in every kind of chip. The green ones include broccoli, green pepper, spinach, tomato, mallow leaves, carrot, and pumpkin. The red ones are carrot, tomato, and red pepper. I guess the green ones are a lot healthier for you considering their heavier mix of greens. The two types of chips were not evenly represented in my bag. There were far more green ones than oranges ones. I don't know if this was intentional or just random chance, but the "orange" vegetables are generally more expensive in Japanese markets than the "green" ones, so it might be an attempt to have more of the cheaper chips, or more of the "healthier" ones. Unsurprisingly, the bag smells like a mishmash of vegetable odors. It's not particularly appealing, but not awful. The chips are spongy and light. They're modestly crisp, but not brittle like a chip or cracker. 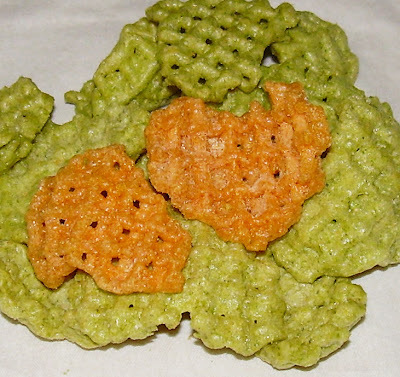 The texture is closer to popcorn than to chips or Cheetos. The nice thing about real vegetables is that their flavor is not very intense. The bad thing about processed vegetables is that they are somewhat like intense distillates of the real thing. That is, it's like someone took broccoli, cooked it into a mush, and then dehydrated it to remove the moisture and increase the intensity. To the extent that these chips fail, that's a big part of it, and I mean the green ones in particular. You can concentrate carrot and tomato and still make for a nice flavor, but you can't do the same with broccoli, peppers, or spinach. It is just too much. The green ones taste like essence of broccoli with a green pepper aftertaste. There's a strong hint of chlorophyll in them. They're not awful, but they're not as good as eating the real vegetable taste-wise, which is saying a lot for a chip. Chips are supposed to make consuming vegetables more fun. The red ones are actually pretty good. They're ever so slightly spicy at the finish because of the tomato and mainly taste like carrot. I will probably very slowly finish this bag, but there's every chance it'll languish in my snack basket for quite some time before I reach the bottom. I definitely wouldn't buy it again. I will note that this seems to be part of a summer trend for "salad" flavored items which appears to be revving up. Funny how they have mallow leaves, something I've never heard of before. I had these ages ago but they seem to have changed, they had light yellow ones and green ones, when I had them. Your description doesn't sound too appetising, so I probably won't go back to them. I hadn't heard of mallow leaves before either. I translated the Japanese for them to find out what they were. They weren't awful, but not the sort of thing I'd crave. I wonder if these are something that Calbee rotates rather than keeps around all the time. I can see people buying them as a novelty, but not as a regular snack. Actually I don't think these are part of any summer vegetable trend. They have been around for a while now, although not widely available every place. They have been on the market for at least six years as my kids have been snacking on these since they were old enough to snack on stuff. I don't like them, and the kids seem to be growing out of them, but toddlers seem to enjoy them.